The redesigned 2019 Hyundai Veloster is a big improvement over the previous generation. It’s more engaging to drive and packed with more technology. 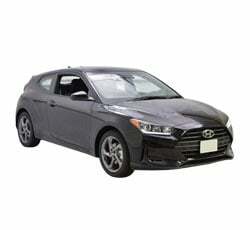 Fortunately, Hyundai didn’t drastically change the Veloster’s unique body style. While the new Veloster has caught the attention of a lot of drivers, it faces some stiff competition from today's other new hatchbacks. Does the 2019 Hyundai Veloster have what it takes to win you over? For 2019, Hyundai decided to completely overhaul the Veloster. It comes equipped with a stronger engine and several updated interior features. You can also take advantage of this hatchback’s additional safety technologies. A high-performance N model is due to arrive at the end of the year. Prices for the base Veloster start at less than $19,000, which is less expensive than the new Honda Civic hatchback. A 100,000-mile powertrain warranty makes the Veloster an especially great bargain. You’ll be able to ride with an extra peace of mind for years to come. Furthermore, Hyundai loaded the new model with popular features like Apple CarPlay and Android Auto. Unlike the previous Veloster, the new model also comes standard with advanced safety technologies. The 2019 Hyundai Veloster is a fun commuter car. Although the Veloster is not the quickest car in the segment, it does produce a bit more power. Most people will be pleased with the Veloster’s standard 147-horsepower engine. Fuel economy stands at a combined 30 mpg. However, this hatchback’s biggest improvement is its crisper handling. It now feels more composed around curves. If the base Veloster fails to excite you, step up to the Turbo R-Spec Model. Its turbocharged engine kicks out a more exciting 201 horsepower and just shy of 200 pound-feet of torque. There’s certainly no denying the Veloster R-Spec’s quick acceleration. It clocked a rather brisk 0-60 time of 6.2 seconds. To give the Turbo R-Spec model the athleticism of a true hot hatch, Hyundai equips it with a sports-tuned suspension and performance tires. All versions of the 2019 Hyundai Veloster feature Drive Mode Select. This feature allows you to tune the Veloster’s steering feel and throttle response. While the Normal driving mode is perfect for everyday commuting, activating the Sport mode makes you feel more connected to the road. Fortunately, Drive Mode Select doesn’t require much effort to use. Simply press a button and you’re all set. Like before, the 2019 Hyundai Veloster has a three-door design. No other hatchback in the segment can rival the Veloster's uniqueness. A sporty roof and cascading grille make the Veloster look special. On the rear, center-mounted exhaust tips and a sleek spoiler give the Veloster a more powerful appearance. Hyundai offers a black roof as an option. Sunset Orange, Thunder Gray, and Racing Red are some of the cool paint colors. Although the Veloster is affordable, it feels like a more expensive vehicle on the inside. Even the standard cloth upholstery looks nice. However, the leather-trimmed Turbo Ultimate model is especially plush and luxurious. Drivers will also enjoy the Veloster’s cool cockpit. All of the interior controls are easy to access and simple to use. Good seat comfort gives you another reason to like the 2019 Hyundai Veloster. The 2019 Hyundai Velsoter is far more practical than a coupe. There’s nearly 20 cubic feet of cargo space behind the hatchback’s backseat. That’s actually more storage space than you’ll find in some crossover SUVs. This is a key benefit for the drivers who enjoy an active lifestyle. From dorm supplies to hiking gear, drivers can fit a lot of stuff inside the Velsoter. If you need to make room for a large item, the backseat easily folds flat. This year, you’ll find more safety technologies on the Hyundai Veloster. In the event that you momentarily lose focus on the road, automatic emergency braking can bring the Veloster to a halt. Meanwhile, lane-keep assist helps prevent you from drifting into the path of an oncoming vehicle. Stepping up to the range-topping Turbo Ultimate model brings pedestrian detection and adaptive cruise control. The available Infinity audio system is destined to delight music lovers. Its more dynamic sound is definitely worth the extra cost. An external amp ensures that your favorite songs always sound clear. To give the system a heavy dose of bass, Infinity designed it with a thumping subwoofer. Hyundai's Blue Link system will prove to be a major convenience. It provides more than just a constant connection to roadside assistance. You can also use Blue Link to obtain vehicle health reports and monitor your teen’s driving habits. When searching for a specific location, Blue Link with navigation can provide Google directions. Think twice before getting the 2019 Hyundai Veloster for your family. While there’s a decent amount of legroom in the front, passengers riding in the back may feel a bit confined. This is especially true for large adults. A sloped roof limits headroom. Although the three-door Veloster is a step above a coupe, it’s still not as accommodating as a four-door car. While the Veloster’s automatic transmission gets the job done, it’s not the smoothest performer in the segment. Some test drivers have notice its slowness to downshift at city speeds. This issue may become an annoyance for some people. If you don’t mind shifting your own gears, the Veloster’s six-speed manual transmission may prove to be more enjoyable. It gives you far more control over the hatchback’s performance. Like its predecessor, the new 2019 Hyundai Veloster features a front-wheel-drive system. While the Veloster can easily handle the task of driving through the rain, it may not handle well in the snow. This could be a key concern for the drivers who will encounter wintry weather on a regular basis. The 2019 Subaru Impreza hatchback comes standard with an AWD system, which is considered to be among the best on the market. The Veloster requires you to manually adjust its seats. While this may not be a big issue for most people, others will desire power seats. Older folks would appreciate the extra convenience. Don’t expect the Turbo R-Spec version to ride like a luxury car. It’s rather firm suspension will cause you to feel more bumps in the road. If you prefer comfort opposed to sportier handling, check out the Turbo and Turbo Ultimate models. Although these models come equipped with a powerful turbocharged engine, they go without the R-Spec's sports-tuned suspension. The 2019 Hyundai Veloster competes against hatchbacks such as the 2019 Honda Civic and the 2019 Toyota Corolla. While the Veloster can’t match the Toyota Corolla‘s predicted reliability, it does offer a more powerful turbocharged engine. Rated to return an EPA-estimated 40 mpg on the highway, the Honda Civic hatchback will reward you with additional fuel savings. There’s also more space to stretch out in the Honda Civic. The 2019 Chevrolet Cruze may catch your eye as well. Car shoppers like its fresh styling and attractive list of standard features. An available diesel engine gives the Cruze hatchback a key advantage over the Velsoter. It’s rated to deliver a spectacular 45 mpg on the open road. Don’t hesitate to take the new 2019 Hyundai Veloster for a spin. Improved driving dynamics and a smoother ride make it a more pleasurable car for commuting. As always, the Veloster’s exclusive styling helps it to stand out from the pack. Great cargo space adds to this hatchback’s appeal. Although the new Veloster hits the mark in several key categories, it still suffers from a small backseat.